In this week’s episode, Robert and I talk about the hit movie from LEGO and what it means for content and brand marketing. In addition, we discuss the blurred line of advertising, Klout’s new publishing tool, and an amazing discovery about Facebook click fraud. This week’s This Old Marketing Example: Home Made Simple, from Procter & Gamble. 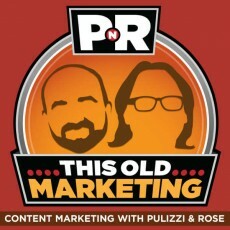 If you enjoy our PNR podcasts, we would love if you would rate them, or post a review, on iTunes. Robert’s Rant: Robert rants about a Sparksheet article that calls for Coca-Cola to end its content marketing journey. Joe’s Rant: I discuss a recent video by Veritasium on Facebook fraud. The conclusions are amazing — a must-watch video for anyone using Facebook advertising. This Old Marketing is offering a free sponsor of the week opportunity. If you have a great piece of content marketing you’d like us to cover, just tweet us at #ThisOldMarketing and we’ll pick our favorite of the lot. This week’s pick: The Manufacturer’s Growth Manifesto (courtesy of Bruce McDuffee). A special shout out to Tom Muyllaert for his recommendation: Luxury Travel Butler. Home Made Simple, from Procter & Gamble, is a site that’s all about recipes and organizational tips, dedicated to “moms on the go.” P&G boasts millions of subscribers for the content brand, and has been running the site for a decade or more.